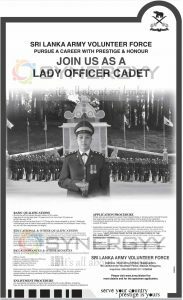 Sri Lanka Army Volunteer Force invites applications for the Lady Officer Cadet, see below details for entry qualification and salary and other benefits. Age should not be less than 18 years and not more than 22 years as at 06 February 2018. Height should not be less than 5′ 3″(Those who have excelled in school / National/ International and all Island level sports will be considered for enlistment even if they do not fulfill the requirement of height). Should have passed two subjects at the G.C.E. (A/L) Examination in one sitting and passed the G.C.E (O/L) Examination in two sittings with four Credit Passes including English and at least Ordinary Passes for Mathematics and Sinhala/ Tamil. Should be an employee of the executive grade in the public/ private sector or possess an annual income of Rs.500,000.00. Any other higher educational qualifications or achievements in sports will be considered as added qualifications. Commissioned Lady Officers will be entitled to fringe benefits to cover expenses on transport, uniforms, medical, food and accommodation. They will also receive opportunities of serving overseas UN Peace Keeping Missions and to follow advanced courses. On successful completion of basic training at the Sri Lanka Military Academy, they will be commissioned as Second Lieutenants and posted to respective Battalions. Those who are employed in government departments or private sector should forward their applications along with the recommendation of the head of the institution. Unemployed applicants should certify annual income of Rs.500,000.00 attested by a Justice of Peace. Applications prepared as per the specimen application with copies of documents mentioned below should reach “Recruiting Officer, Headquarters, Sri Lanka Army Volunteer Force, Salawa, Kosgama’ by registered post on or before 06 February 2018. The clause “LADY OFFICER CADET IN THE VOLUNTEER FORCE OF THE SRI LANKA ARMY” should be mentioned on the top left corner of the envelope enclosing the application.